In 2015, the John Stauffer Charitable Trust extended a challenge to the University of Redlands: raise $2 million for the Student Science Research Program endowment and the trust would provide another $1 million. Thanks to the generous contributions of 150 U of R alumni, faculty, and friends, the program’s endowment will now become a reality. 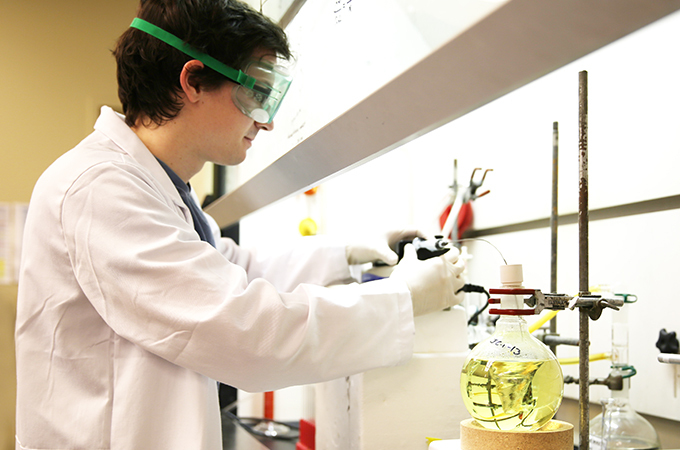 U of R’s Student Science Research Program accepts approximately 30 students each summer to perform lab and fieldwork research projects alongside faculty in a number of scientific disciplines. Alumni of the program frequently continue on to graduate school and successful careers in the sciences. “We are most pleased with how this valuable experience opens students’ eyes to the potential for a future in research in the sciences, especially chemistry and biochemistry,” says Tim Gosney, a co-trustee of the Stauffer Trust. Created in 1974, the trust supports higher education and medical organizations through the legacy of John Stauffer, former president and major shareholder of Stauffer Chemical Company. The University has enjoyed a strong partnership with the trust for decades, spearheaded by the late Jess Senecal ’52, a former U of R Trustee and Stauffer co-trustee. Learn more about Summer Science Research and the Stauffer Center for Science, Mathematics, and Environmental Science at the University of Redlands.